Maria Elena Morató was born in Barcelona in 1958. She studied drawing and painting with her father, the well-known painter Morató Aragonés, and took a degree in Communication Studies at the Independent University of Barcelona in 1981. Actually she combines her painting activities with her work as a journalist, art critic and independent editor. She is a member of AICA (International Association of Art Critics) and a regular contributor to numerous art magazines. At the same time she had exhibitions of her works in Spain, France and Italy and participated in different European Art Fairs as well as in Art Fairs in the Maghreb, Middle East and America. 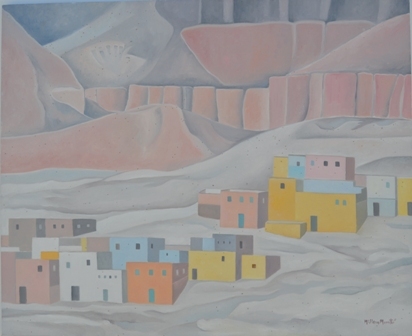 Since her beginnings, the main motif of her paintings are landscapes, fundamentally urban landscapes, alternating European themes and atmospheres ( with preference for grey shades) with the light and colours of North African cities, whose structures became one of her characteristic features. The unlike architecture of Mediterranean and European villages and those of the Sahara and Middle East is reflected in a work in which the trace of the human being is sensed through the line and the colour.